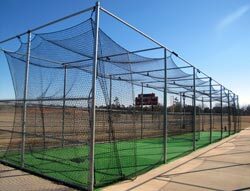 Our handmade nylon batting cages are of the highest quality and custom made in various sizes and weights. The netting is a high tenacity nylon twine, dyed black, bonded and UV stabilized. All of our batting cages and foul ball screens are hung on the square to minimize sag. All perimeter edges including bottom and center rib line have a 3/8" diameter rope, and are serged with a continuos triple hitch seam, for a very strong border. Top and bottom corners are also reinforced and have 5 foot tails for tying. Nylon netting has a more compact nature than poly netting, and over time breaks down when placed outside. It's high tensile strength make it ideal for indoor use. Length: ft. 0"1"2"3"4"5"6"7"8"9"10"11" in. X Width: ft. 0"1"2"3"4"5"6"7"8"9"10"11" in. X Height: ft. 0"1"2"3"4"5"6"7"8"9"10"11" in. BASEBALL BATTING CAGES ARE MADE ON ORDER,CONSIDERED CUSTOM MADE AND ARE NOT RETURNABLE, EXCEPT FOR MANUFACTURER DEFECTS.